Laparoscopic has become main stream as minimally invasive surgical alternatives for patients with clinically localized prostate cancer for last 10 years. 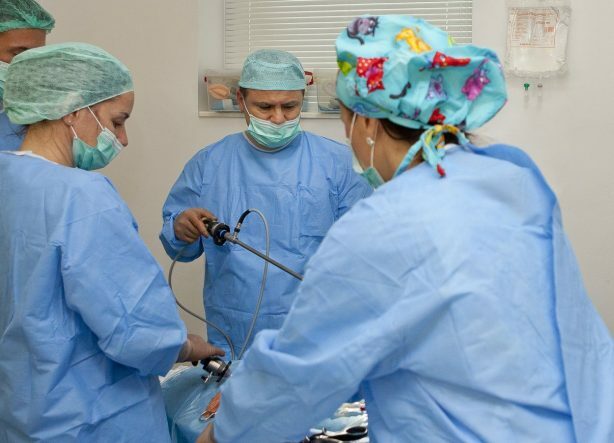 Laparoscopic surgery allows a surgeon to perform complex procedures within the abdomen without having to place his hands directly into the body cavity. This is achieved by using miniatuaized instruments placed through portals, called trocars, inserted through keyhole size incisions made in the abdomen. The abdominal cavity is inflated with carbon dioxide gas to provide a working space for the surgeon to operate in. Visualization of the internal anatomy is provided by a high definition, digital camera attached to a telescope lens inserted through one of the troacar sites. As the incision size tends to be smaller than for open surgery, postoperative pain is reduced in addition to blood loss and transfusions. In our clinic prof. dr.Jens-Uwe Stolzenburg performs laparoscopic nerve-sparing radical prostatectomy. To schedule an appointment in Hill clinic, please, do not hesitate to call us: + 359 2 439 31 31.